THE HOME YOU'VE BEEN WAITING FOR. 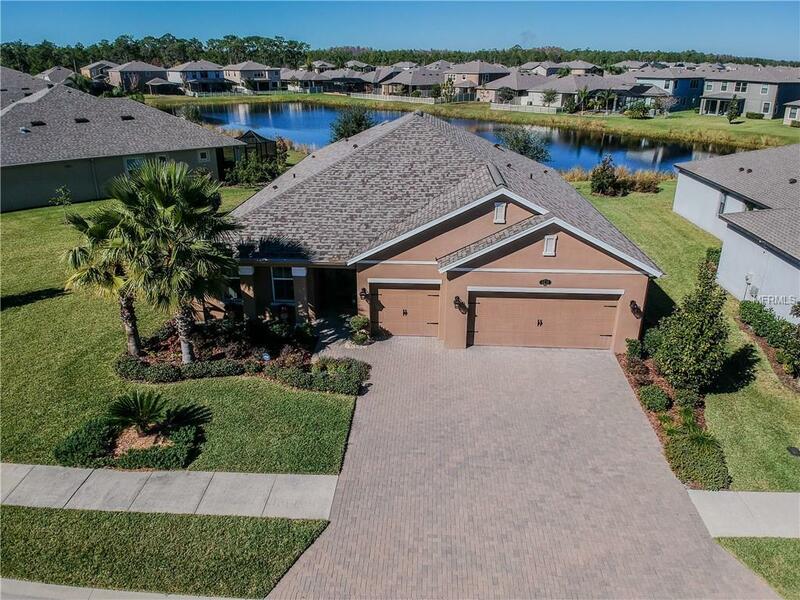 This Beautiful NEWLY BUILT Beazer home is located in the Community of Long Lake Ranch. There is so much to impress. This OPEN CONCEPT 4 bedrooms 3 full bathrooms is perfect for entertaining. You will be wowed by the spacious GOURMET KITCHEN that features GRANITE countertops, STAINLESS STEEL appliances, double ovens, designer 42" wood cabinets, decorative tile back-splash and large kitchen island. This wonderful SPACIOUS kitchen overlooks the large family room and breakfast area that leads out to the screened in and covered LANAI which has spectacular Views of the POND. The MASTER SUITE has a large WALK-IN CLOSET with custom designed wood shelving, WALK-IN SHOWER and DUAL SINKS with GRANITE countertops. Bedroom 2 and Bedroom 3 share a JACK AND JILL bathroom which has DUAL sinks and GRANITE countertops. New ROOF in Dec 2018. Other features include Glass front door, staggered 19" tile floors, 2" faux blinds, ceilings fans throughout including the lanai, large LAUNDRY ROOM with custom cabinets for extra storage, UPGRADED Water Softener with built-in Whole House Water Filter, 1/4 ACRE WATERFRONT LOT, a large 3 CAR GARAGE and beautiful landscaping. There's so much more. you must come see for yourself.